Budugul is famous as the cool mountain area and great view. 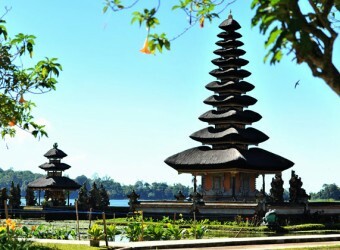 In the highland, Ulun Danu Bratan is located beside Bratan Lake. This temple was built by the King of Mengwi in 1633. This temple enshrines Dewi Danu, the goddess of lake. Once in a year, the lake’s water comes into the temple during the rainy season. People believe that the lake makes purify the temple for the goddess. Lake Beratan is situated in Bedugul a tourist spot with cool mountain air and beautiful mountain panoramic view. The temple is located on the shores of this lake. As on the word of mouths, this temple is really mysterious. The view of the temple from the boat is also great! I recommend this!